In addition to the very trendy pallet wood, I also had a few "classic" (read: old) tomato cages made of wire. They matched better with the tomatoes that have only been untended for a month rather than the two month giants. It's not called procrastination. It's called succession planting. Wrestling the tomato was an Ultimate Fighting challenge. I was winning, I was losing. We were both on the ground! I was sweaty and bleeding. Finally, victory! I got a couple weaklings into the skinny ends of the cages. Again, I am wondering at the design of these cages. Why? For the love of humanity, WHY?! It's like voting in a Presidential election: Are these really the best we can come up with? 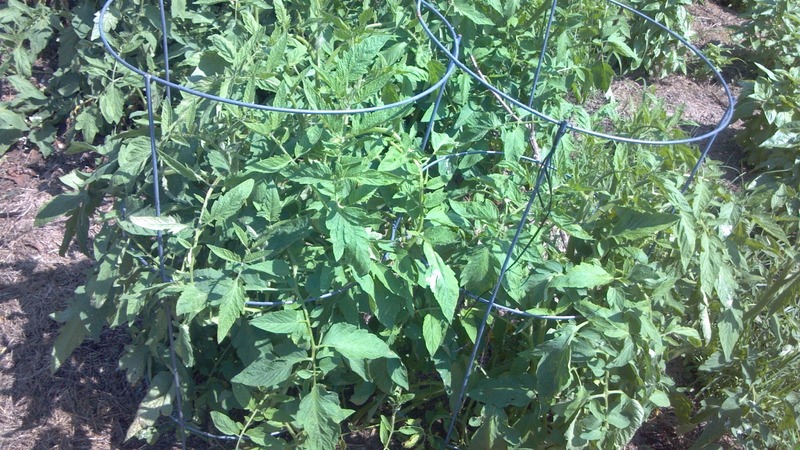 of these skinny wires holding up these cages for even a day, I pushed them all the way into the ground until the bottom ring actually supported the caged tomato and the wires just pinned that to the ground. In a month the whole thing may look like a weeping willow. I never held much hope that the tomato seedlings would survive, so the plants are much too close together. This really worked out well! 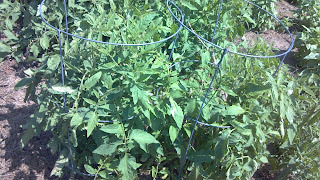 The tomato cages snuggle together in a manner that is both touching (pun intended) and might help lend more support. My brilliant son, who refuses to ask the smart phone for help because it makes him feel stupid, pointed out that when the wind takes down this contraption, it's all coming out of the ground like an uprooted tree. Thanks Pumpkin. We know the real reason you don't ask for directions from the phone: Y chromosome. There is also a tough red tomato cage with a much more logical design. The big end is on the bottom! It's easy to spot since it's bright red and square, but it's also made of really sturdy wire and is open on one side. I wish I hadn't been so cheap as to only buy one. Maybe I'll go back and check that store for more. I'm sure they still have them after four years! At last the time has come to try the teepee design. I'm not sure how I can make that work for the overgrown tomatoes, but luckily I somehow planted POLE BEANS! I was really just trying to clean out the seed closet, now I have eight rows of POLE BEANS! Yeah, I have time for that.